Jan Lievens (1607–1674), Quintus Fabius Maximus (1656), media not known, 203 x 175 cm, Paleis op de Dam, Amsterdam, The Netherlands. Wikimedia Commons. Plutarch claims that the first Fabius, founder of the great Fabii family of Rome, was the son of Hercules (Heracles), and that Quintus Fabius Maximus, the greatest of the clan, was fourth in descent from him. Because he had a small wart growing above his lip, he was given the name of Verrucosus, but was later known as Cunctator, meaning the delayer, from his guerilla warfare strategies. Fabius Maximus was consul of Rome for five terms in all. In the first, he led Roman forces against the Ligurians, who were defeated and driven back into the Alps. Artist not known, Triumph of Quintus Fabius Maximus (date not known), frieze, chimney of the Burgemeesterskamer, Koninklijk Paleis, Amsterdam, The Netherlands. Image by C Steenbergh, via Wikimedia Commons. After this victory, he enjoyed a traditional triumph, perhaps that shown by an anonymous sculptor in this undated frieze of the Triumph of Quintus Fabius Maximus. Curiously, this frieze is not in Italy, but on the chimney of the Burgemeesterskamer in the Royal Palace in Amsterdam. In the middle of the 1600s, at the height of the Dutch Golden Age, Fabius Maximus became a popular figure in Dutch art. He is shown standing in a chariot being drawn by four horses, towards the right end (back) of the triumphal procession, and is referred to in the Dutch text above the frieze. When Gaius Flaminius was consul later, Hannibal the Carthaginian general invaded Italy, leading Flaminius to fight the Carthaginians by the river Trebia. In the midst of the battle, there was a major earthquake; the Romans were soundly defeated and put to flight, and Flaminius himself was killed. As a result, Fabius was made dictator. Fabius appointed Marcus Minucius as his Master of Horse, and was given approval to ride a horse himself when in the field – an exceptional situation, as the Roman army was predominantly infantry, and traditionally commanded on foot. One of his first tasks was to raise morale among Romans, which he did by getting them to propitiate the gods. His tactics against Hannibal were innovative: he kept his troops in hilly areas, which made it hard for enemy cavalry to come near. When Hannibal’s troops were on the move, he brought his men close enough for them to be detected, but kept them away from joining in battle. This waged a guerilla war of attrition, in which Hannibal’s army grew steadily weaker, while the Romans stayed in fine form. 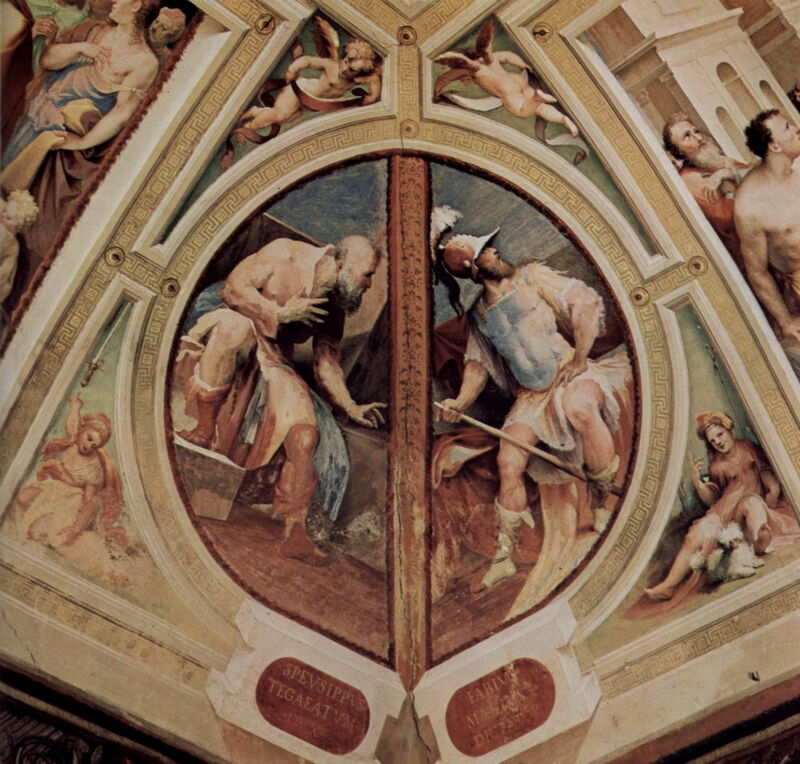 Domenico di Pace Beccafumi (1486–1551), Speusippus Tegaeatum and Fabius the Great, from The Political Virtues (cycle) (1532-35), fresco, dimensions not known, Palazzo Pubblico, Siena, Italy. Wikimedia Commons. As with others in Plutarch’s Lives, depictions remained popular during the Renaissance. Beccafumi’s Speusippus Tegaeatum and Fabius the Great shows two of the figures from his fresco cycle of The Political Virtues, from 1532-35, in Siena, Italy. Fabius is seen sitting, in wait for Hannibal, rather than fighting him. These tactics were not popular with his troops, who thought Minucius’ desire to go into battle was preferable. But eventually the tactics of Fabius won the day: after a misunderstanding with his guides, Hannibal’s forces were led down into a valley of the river Vulturnus. Fabius led four thousand of his heavy cavalry to block the outlet of that valley, then attacked the rear of Hannibal’s column. Hannibal had torches tied to horns of some local cattle, and drove them towards the Romans at night. When those torches burned down, the cattle and surrounding forests caught fire, convincing the Romans that they were surrounded by advancing enemy. 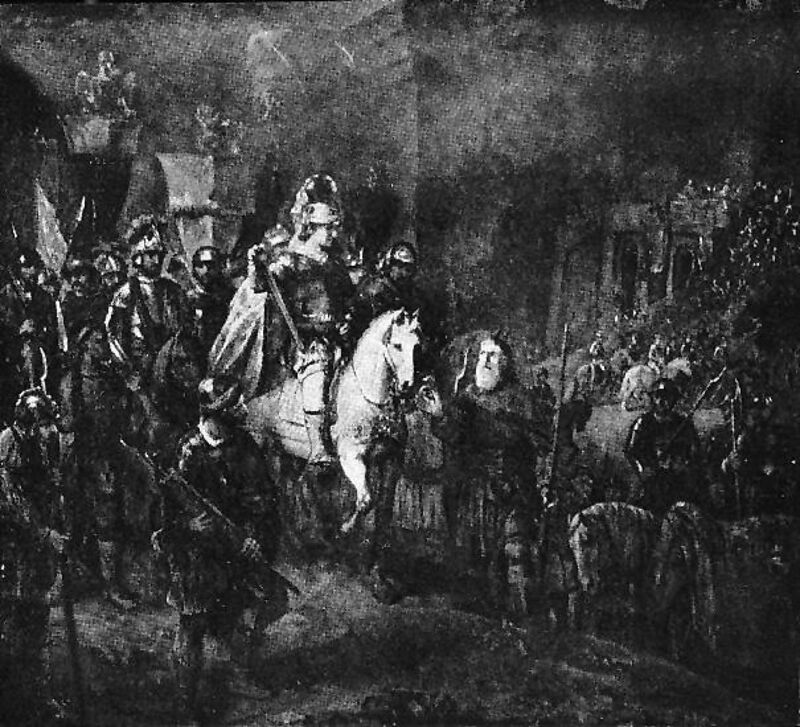 Hannibal was therefore able to escape with his army. 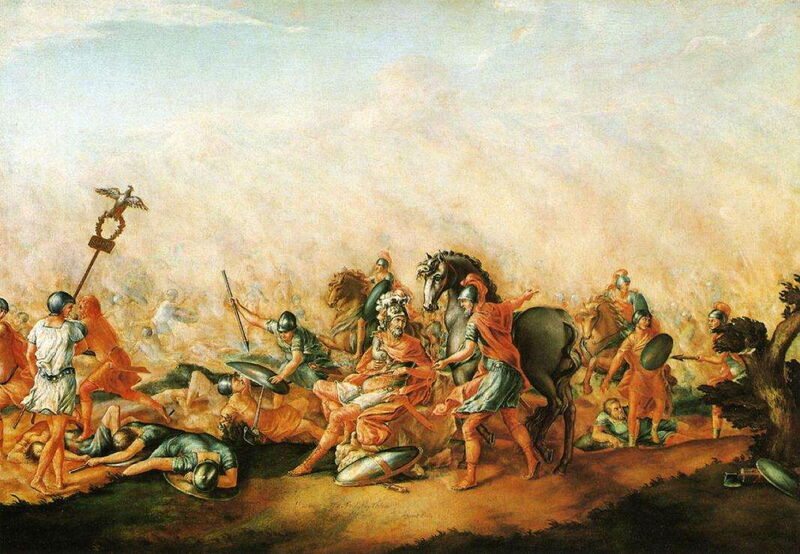 Fabius pursued the Carthaginians, but was beaten back by fearsome Spanish troops. Rome arranged an exchange of prisoners, then discovered that Hannibal had held back 240 Romans for ransom, which the Senate was not prepared to pay. Fabius arranged to sell sufficient of his own land to raise the ransom himself, and bought the release of all remaining prisoners of war. Fabius was summoned back to Rome, leaving the Roman army under the command of Minucius. Although the latter had been told not to engage in battle, he waited until most of the enemy army were out foraging to attack those left in camp, and won a cheap victory. Back in Rome, after public speeches, the people voted for Minucius and Fabius to share military command. When Fabius returned to the army, he found Minucius puffed up with conceit, and demanding sole command, which Fabius wouldn’t agree to. They therefore divided the army between them as Hannibal was preparing to occupy a hill between the two groups of Romans, and draw them into battle. Minucius fell into the trap, and his forces were surrounded and many killed by the Carthaginians. Fabius then attacked Hannibal’s men from the rear, and his army fought its way through to rescue Minucius and his surviving troops. When the two Roman armies were united again, Minucius admitted his error and relinquished command to Fabius. After this campaign, Fabius gave up the office of dictator, and consuls continued to use his guerilla tactics to avoid direct engagement with Hannibal’s army, until Terentius Varro was appointed consul. The latter assembled a force of 88,000 Romans to take Hannibal on in battle, against the advice of Fabius. The other consul alongside Terentius was Paulus Aemilius; when Fabius tried to persuade him to oppose Terentius, Paulus replied that it was better for him to face the enemy than another vote of the people. So the Roman army marched to Cannae, where at dawn they launched their attack on the Carthaginians. Hannibal used two strategies: he fought with a very strong wind behind his men, which drove a huge cloud of dust over the Romans, causing confusion. He also arranged his men in a wedge, with the strongest at the outside, so that his best fighters could turn and attack the Romans’ flanks and then their rear. Paulus’ horse was wounded, and unseated the consul. When others saw this, they dismounted to defend him on foot; this was misunderstood as a general order to dismount, and the Roman cavalry became infantry soldiers. Terentius fled to the city of Venusia to save his own life, but Paulus had multiple wounds and was killed. John Trumbull (1756-1843), The Death of Aemilius Paulus at the Battle of Cannae (1773), oil on canvas, 62.2 x 88.4 cm, Yale University Art Gallery, New Haven, CT. Wikimedia Commons. The American history painter John Trumbull was still a student, and only seventeen, when he painted The Death of Aemilius Paulus at the Battle of Cannae (1773). This shows the consul surrounded by growing piles of bodies as Hannibal’s troops got the better of the Romans, and his refusal to flee the battlefield despite his own imminent death. Hannibal’s army killed fifty thousand Romans, and took another fourteen thousand as prisoners of war. Rome had suffered its greatest defeat, and to the city’s surprise, Hannibal followed it up not by attacking Rome, but by winning over the rival city of Capua and much of the rest of Italy. Back in Rome, the wisdom of Fabius was now appreciated, and he was again put in charge to restore order to its citizens. He stationed guards on the city’s gates to prevent the fearful from leaving, and placed a deadline of thirty days on all mourning for the dead. Fabius and Claudius Marcellus were then sent out with armies to deal with Hannibal. Fabius returned to his guerilla tactics, but Marcellus fell into an ambush and was killed by Hannibal. Fabius won back the city of Tarentum by stealth. He got one of his soldiers into the city, posing as a deserter, who managed to win over the commander of Hannibal’s forces there. Fabius arranged a diversionary attack to draw Hannibal’s forces away, and surrounded Tarentum. Romans entered the city thanks to the insiders, and quickly overran its defences. 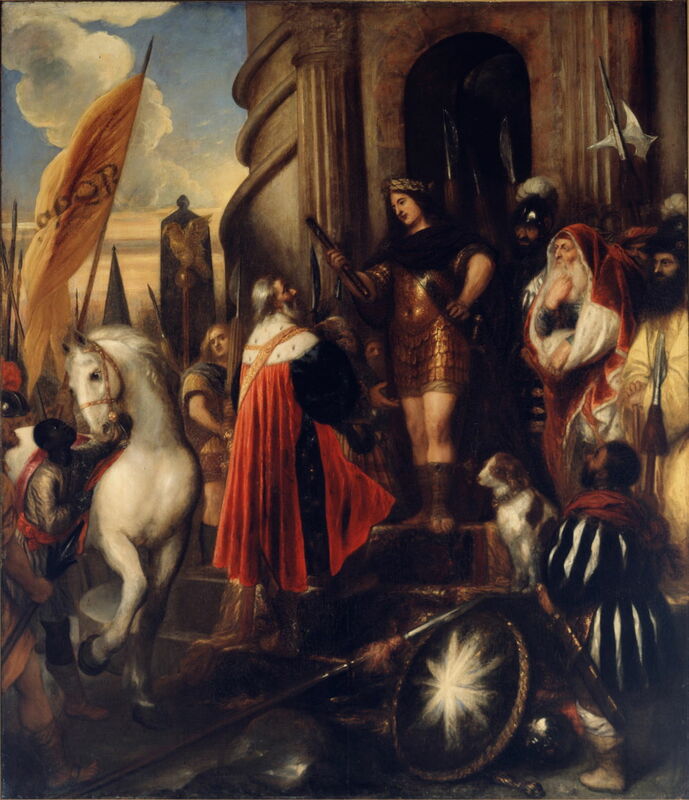 Another fan of Fabius during the Dutch Golden Age, Jan Lievens’ painting of Quintus Fabius Maximus from 1656 may be referring to this victory at Tarentum, although it appears hard to read. Hannibal was only five miles away at the time of the Roman repossession of Tarentum, and this made him realise the impossibility of mastering Italy. Fabius enjoyed a second triumph back in Rome. Fabius’ son was made consul of Rome, and father and son went out with the army together. When they won another victory, the father let his son enter the city of Rome in a four-horse chariot, while he followed with the rest of the train. Sadly, Fabius’ son died early, and his father delivered the funeral oration himself. Rembrandt Harmenszoon van Rijn (1606–1669), Quintus Fabius Maximus Visiting his Sons at the Camp of Suessa (c 1654), oil on canvas, 179 x 197 cm, location unknown (stolen during World War 2). Wikimedia Commons. Rembrandt’s painting of Quintus Fabius Maximus Visiting his Sons at the Camp of Suessa from about 1654 is another Dutch mystery, although one which we can no longer solve. Suessa was an ancient city in Latium which doesn’t appear associated with Fabius. This photograph is all that is left of a fine painting by Rembrandt which was stolen during World War 2, and is still missing, making it impossible to discover exactly what Rembrandt depicted. Late in Fabius’ life, Scipio Africanus fought the Carthaginians in North Africa, in actions to which Fabius was strongly opposed. Fabius did not live to see Scipio crush Hannibal, though, as he fell ill and died as the Carthaginians were returning from Italy to North Africa. He had remained poor, but every private citizen gave a coin in subscription to the costs of his funeral, as they felt that they were burying a father. Plutarch’s comparison is brief, and starts by pointing out that Pericles led the Athenians when they were most prosperous, but Fabius Maximus had to take charge of Rome when it was suffering its greatest misfortunes, in the shape of Hannibal in particular. Pericles had nine trophies for his victories on land and at sea, but Fabius only had one regular victory which he could claim as his own. Perhaps Fabius’ greatest military achievement was saving an entire Roman army under Manucius from the hands of Hannibal, something with which Pericles had no compare. Ultimately, though, Rome’s success against Hannibal was that of Scipio, who effectively proved that Fabius had been in the wrong. Pericles was the greater statesman, having more influence and power than Fabius. But Pericles led to the Peloponnesian War by refusing to concede to Sparta, and Fabius fell short with his inability to restrain others. Both resisted the temptation to profit from their successes, but only Pericles adorned his city with great buildings – whose ruins are still the best-known features of Athens. Posted in General, Life, Painting and tagged Beccafumi, biography, history, Lievens, morality, painting, Plutarch, Rembrandt, Trumbull. Bookmark the permalink.